It is a glorious time of year in gardens here despite the lack of rainfall this summer. These lilies were growing on a stalk so high that it was above my head. I love the colour of the flowers! 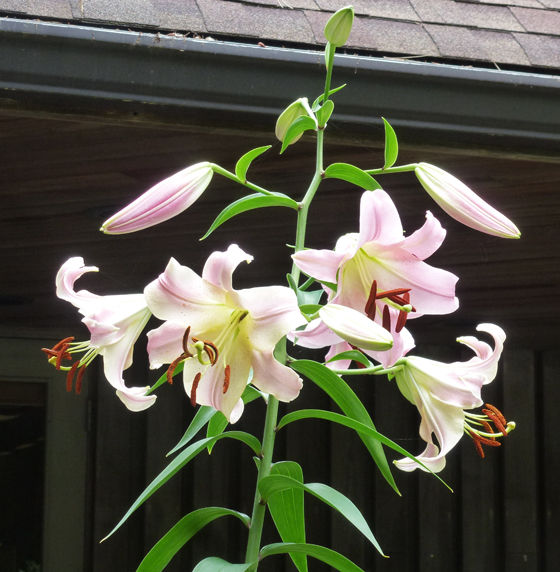 That is a tall lily, and very pretty, too! Beautiful lilies. We have had too much rain, I wish I could send you some. Beautifully shaped blossoms an such subtle shades of colour. I am amazed at the height; have never seen them so tall. Lovely... in fact they look spectacular! Gorgeous blooms. They all look so perfect! But you didn't tell us how tall you are! Tall beauties, they are gorgeous. I love both of your photos, P! Yes, rich and vibrant and standing tall for all to enjoy. Fantastic flowers, and fantastic shot, Pat ! I love the look of lilies but am not a fan of their scent. Do you grow lilies? I tried years ago and had no luck. These have a nice, subtle blush.